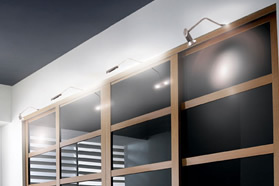 All of our lighting systems have been designed specifically for use with made to measure and standard size sliding door wardrobes. 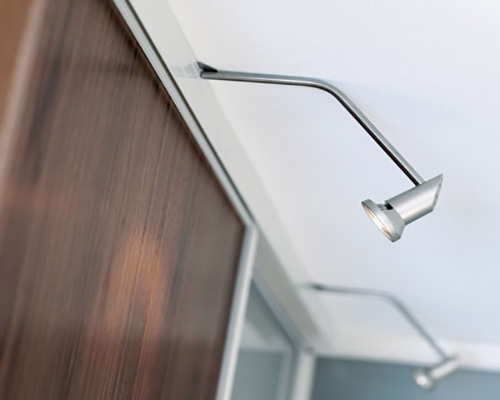 Simply loosen your top track and position lights between top track and ceiling…easy. Ideal for those early starts, or late nights when you don’t want to wake a partner! To enable your lights to turn on and off automatically when you open your sliding wardrobe doors, purchase our infra red sensor which is triggered by movement. The sensor can be positioned inside you room, so that lights turn on when you enter the bedroom, or it can be positioned inside your sliding doors, so that its triggered to light up your wardrobe when you open your doors. You can adjust how long the lights stay on after detecting movement, from 5 seconds to 6 minutes.